PREORDER66: PREORDER66 x TAMASHII NATIONS - NYCC 2013. INTERVIEW TIME! Crasis stops by the Bluefin/Tamashii Nations booth during NYCC 2013 to discuss monsters, Jaegers, robits, rangers and Miley Cyrus (?) with Bandai's Adam Newman. SP13 on iTunes! Please subscribe and/or rate us today! 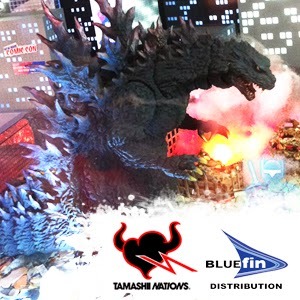 Please leave comments below to have your voice heard for potential future Tamashii Nations products! What music artist(s) would you like to see in S.H.Figuarts form? Let us know! You want some S.H. Musicarts suggestions eh? - No problems! Why not more kamen rider and super sentai villains, you know the monster of the week? Why not more super sentai figuarts? Why not more aliens and predator monsterarts? Why not more Godzilla monsters as monsterarts? Gamera? Why not pacific rim as monsterarts? Why not more animes as figuarts, YuYu Hakusho? Saint Seiya? Dragon Ball? Rurouni Kenshin? Shurato? Why not more games as d-arts or figuarts? Wheres the rest of SNK characters? Only Terry? Capcom games? Tekken? Soul Calibur? Mortal Kombat? Why not Star Wars figuarts? There is so many good thing to make figuarts, monsterarts and d-arts, why make some music figuarts? Baragon, Hedorah (do him like Destoroyah with all his different forms?) a Tanks/Planes/Buildings pack we could set up to have our beloved Kaiju knock down! How about remodeling/Remaking Kamen Rider Decade??? He Needs a new Helmet, A loose belt I.E. Kamen Rider Wizard belt, and better paint application. The First Decade was more traditional, eyelets wise but the rest of him screamed help. Power Rangers Megaforce Figuarts I want to get done. I didnt get why you would put out Gosieknight and not continue with the rest of the Group??? Yeah, where's all the cool stuff because this podcast makes these figures. I've got a strange sense of Déjà vu listening to this. I would love to see Muse since I love that band and they are rife with potential for figures just due to the wide array of instruments and visuals they use in their live shows. I would like to see a Mr Satan to go on my DBZ figuarts shelf. I'm a big fan of the figuart line.I'm also a fan of pop/rock. I would love to see a music figure of Queen like Freddie Mercury,Brian May,Roger Taylor,John Deacon.